For luxury senior living, Glendale, AZ’s new MorningStar of Golden Ridge is sure to please. Conveniently located at North 67th Avenue and West Golden Lane (near Cardinal’s Stadium) on a 8.8 acre campus, MorningStar of Golden Ridge offers 65 suites for assisted living in a range of floor plans along with 35 secure suites devoted to the individualized care of those with Alzheimer’s and other dementia-related diseases. For those looking for independent living, we also have 38 well-designed Casitas with attached garages. Structured as quadraplexes, the Casitas are set back on the property within their own private neighborhood and have a clubhouse and swimming pool. Centrally located, our gorgeous senior living Glendale community offers independent living for those who want to be free from the responsibility of maintaining a home while providing predictable budgeting, built-in companionship, and the opportunity to enjoy our wellness programs and activities. MorningStar’s assisted living is ideal for those who wish to keep their independence but require a little daily help to do so. We are also proud of our exceptional memory care that finds ways to connect with and lovingly nurture our most tender residents. Another reason why MorningStar of Golden Ridge is so special is that our entire community was designed to serve the needs of our residents. From our stylish private suites and Casitas designed with high ceilings, large windows, carpeting, and mini blinds to our beautifully-appointed common areas, residents will certainly feel right at home. And we are pet friendly! In addition to three daily, nutritional and tasty meals (two daily meals for Independent Living) prepared by our Executive Chef and served in our elegant dining room, we have an on-site bistro, salon, theatre, fitness centers, spa bath and much more. Activities include trivia and card games, exercise groups, arts and crafts, entertainment and more. Our grand opening is slated for late 2018. But connect with us today through our on-site Information Center. MorningStar of Golden Ridge is designed to offer seniors a place where they can enjoy their retirement years to the fullest. At MorningStar of Golden Ridge, we are proud to offer the very best in senior living with a unique mission statement of “to honor, to serve, to invest.” We have built a foundation on honoring God, valuing all seniors and selecting staff with a felt calling to serve in order to create a true home for residents in a beautiful, serene setting. 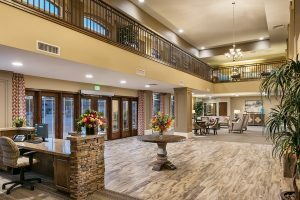 Please contact our onsite Information Center to learn more about one of the finest communities for senior living Glendale AZ offers.